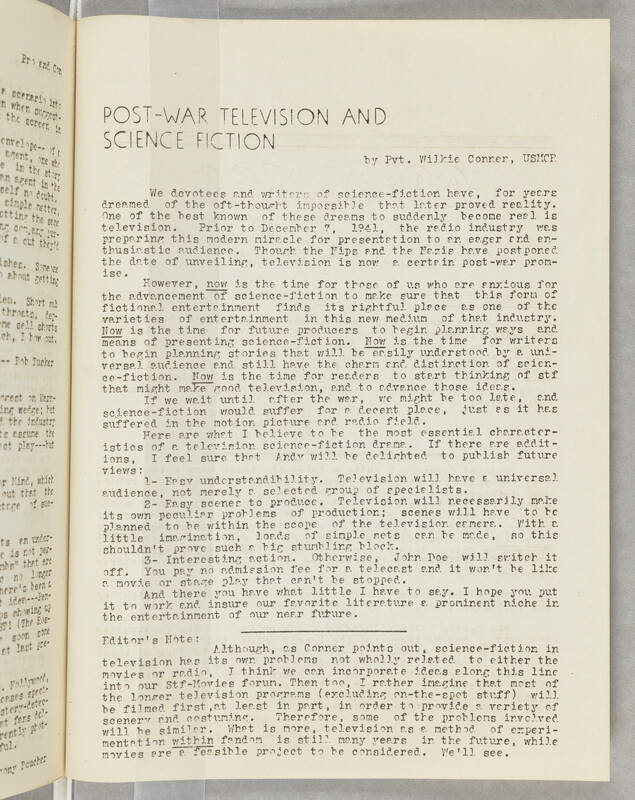 POST-WAR TELEVISION AND SCIENCE FICTION by Pvt. Wilkie Conner, USMCP We devotees and writers of science-fiction have, for years dreamed of the oft-thought impossible that later proved reality. One of the best known of these dreams to suddenly become real is television. Prior to December 7, 1941, the radio industry was preparing this modern miracle for presentation to an eager and enthusiastic audience. Though the Nips and the Nazis have postponed the date of unveiling, the television is now a certain post-war promise. However, now is the time for those of us who are anxious for the advancement of science-fiction to make sure that this form of fictional entertainment finds its rightful place as one of the varieties of entertainment in this new medium of that industry. Now is the time for future producers to begin planning ways and means of presenting science-fiction. Now is the time for writers to begin planning stories that will be easily understood by a universal audience and still have the charm and distinction of science-fiction. Now is the time for readers to start thinking of stf that might make good television, and to advance those ideas. If we wait until after the war, we might be too late, and science-fiction would suffer for a decent place, just as it has suffered in the motion picture and radio field. Here are what I believe to be the most essential characteristics of a television science-fiction drama. If there are additions, I feel sure that Andy will be delighted to publish future views: 1- Easy understandibility. Television will have a universal audience, not merely a selected group of specialists. 2- Easy scenes to produce. Television will necessarily make its own peculiar problems of production; scenes will have to be planned to be within the scope of the television camera. With a little imagination, loads of simple sets can be made, so this shouldn't prove such a big stumbling block. 3- Interesting action. Otherwise, John Doe will switch it off. you pay no admission fee for a telecast and it won't be like a movie or stage play that can't be stopped. And there you have what little I have to say. I hope you put it to work and insure our favorite literature a prominent niche in the entertainment of our near future. Editor's note: Although, as Conner points out, science-fiction in television has its own problems not wholly related to either the movies or radio, I think we can incorporate ideas along this line into our Stf-Movies forum. Then too, I rather imagine that most of the longer television programs (excluding on-the-spot stuff) will be filmed first ,at least in part, in order to provide a variety of scenery and costuming. Therefore, some of the problems involved will be similar. What is more, television as a method of experimentation within fandom is still many years in the future, while movies are a feasible project to be considered. We'll see.